So what are the products inside April 2013 version?? Check it out below. 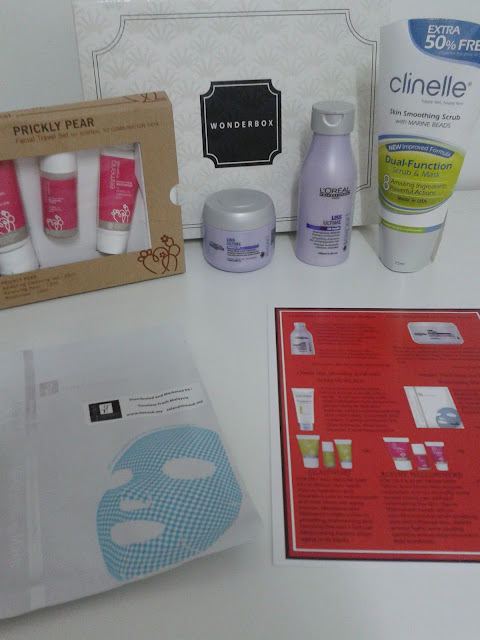 This months my Wonderbox parcel is abit bulky compared to previous months.. Y is that? well on top of the WonderBox the Prickly Pear products came in another box and it was attached on the top part like staging to the main box. I never come across these range before and the pear name caught my attention :) I never tried Pear based products before and would love to give it a try. However I am currently doing my 10 days challenge with another brand and will only able to try out once I am done with that. 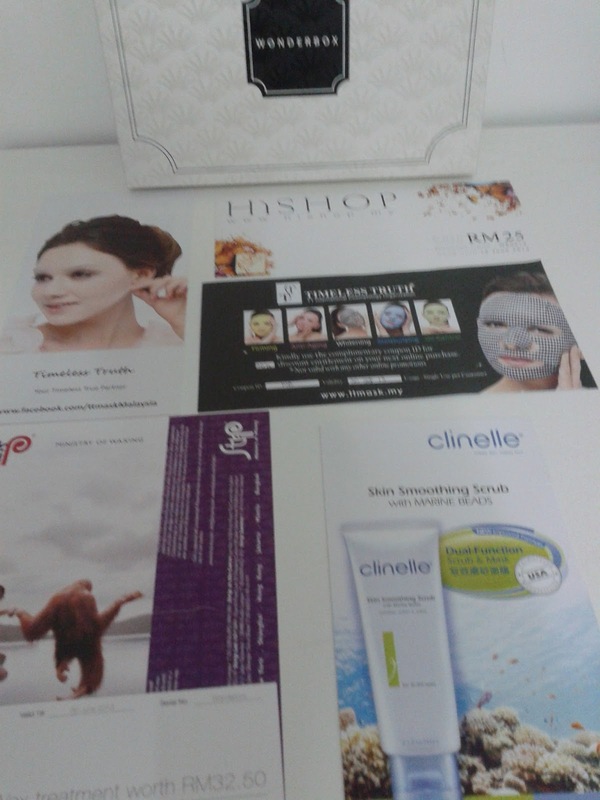 This month another Clinelle product were given.. Normally only small sample but this time around there is an improvement by giving out full size of face scrubs :) This scrubs contain Vitamin B3, Olive extract, Aloe Vera, vitamin E and peppermint. Yeehaaaa! because they provide hair care range this time around and it a deluxe size of Loreal Liss Ultime Shampoo and mask :P Always love hair care because you can hardly go wrong and you can always n easily alternate hair care products compared to skin care. Last but not least, TT Mask......................... Oh my so happy! If your read my earlier post I wast just talking about TT Mask this time around I got the Deep Sea Moisturizing Mask and being a mask freak.. I cant wait to try it! woot woot! What do you think? for me this month's box is good in terms of products selection and size and this time around they include service as well. For me it is worth it. wow.. all in big size packing, thats great! Samsung S4 will be Launch in Malaysia Soon! KFC Spicy Korean Crunch - Really that good meh? ?